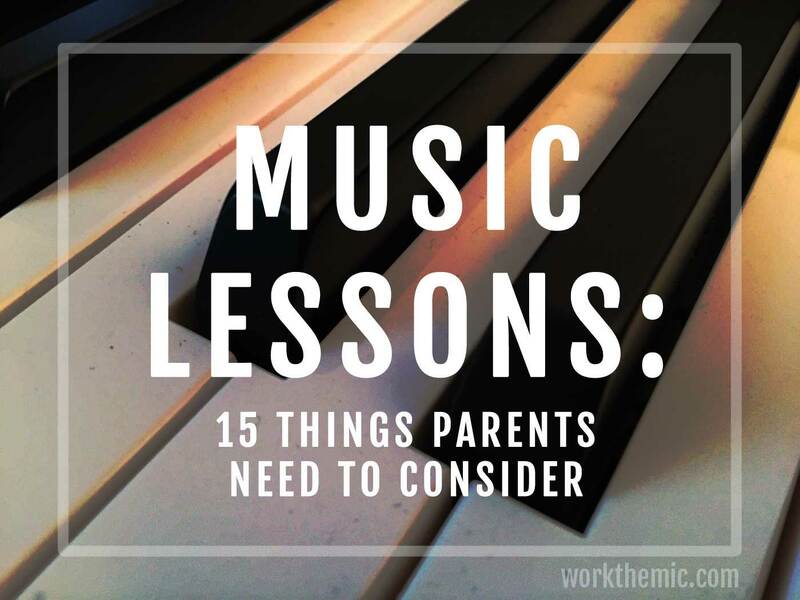 As a musician, I've gotten a lot of questions from parents about music lessons. "What instrument should my child play?" "How do I get him to practice?" "How much money should I spend on the instrument?" and so on. I figured it was time to post my answers for any parents out there I've never met who might have similar questions. 1) The kid has to play music he cares about. No one wants to play "Mary Had a Little Lamb." You want to play the music that you listen to. What are your kids into? Let them choose what you play in the car sometimes. 2) Expand your kid's horizons. Create Spotify playlists together. Listen through movie soundtracks, which tend to have a good sampling of eras and genres. What does your child respond to? What does she hate? Look up the artists that influenced her favorite artists and play that for her. If she likes One Direction, what does she think of N'Sync or Motown? Spotify has a "similar artist" feature which is hit or miss. Allmusic.com is probably a more consistent source of information about influences. 3) Split practice time equally into skill-building, and free-play. They've got to learn scales, but if they don't get some time to be creative, they'll abandon music real quick. There has to be a balance of candy and vegetables. 4) Give them a chance to decide what instrument they want to play. Go to the music store, and let them get their hands on a few different things. Go a few times before you commit to a purchase. Borrow a friend's instrument. Rent before you buy. Don't splurge on a Bosendorfer or Les Paul until they show some skill and investment. 4a) Go to a real music store and talk it out with the sales guy. Wal-Mart and Best Buy are not music stores. Bring a friend who actually plays and let them fiddle with the instrument you're considering. While you don't want to waste money on expensive gear that your kid might abandon, you also don't want total crap that will go out of tune so often that your kid will get frustrated and give up. 5) Don't get upset when kids change their minds about what instrument they chose, because they're most likely going to change their minds. As I mentioned in the intro, I went through piano, saxophone, drums, guitar, and voice as a kid. My parents, teachers, and friends labeled me as a "quitter." Guess what? I still sing, and I still play everything but the sax (because unless you're recording "on hold" music for customer service call centers, there's clearly no use for it). Being able to mess around with more than one instrument turned me into a better musician, band leader, sound tech, and songwriter, and helped to keep me interested in music in general. 6) What are the kid's goals? Will he perform at recitals? Does he want to join a garage band? Does he just want to mess around at home? There are no right answers, but knowing what he's in it for will determine how much practice time he needs, what kind of instrument he buys, and how much pressure you apply, among other things. 7) Practicing 10-20 minutes every day is probably better than 1 hour once a week. Building practice into a kid's routine makes it a lot easier to stick with it, and keeps his skills current. It also helps with the physical components like callouses, muscle memory, and breathing. 8) Keep the instrument handy. Don't hide it in the back of a closet. I keep my guitar in a case right next to my couch. When I want to play, I pop open the case, tune it up, and go. The only reason I even keep it in a case, and not on a guitar stand is because of the changing temperatures in my apartment, which wreak havoc on the wood. You should still take care of your instrument, so keep dust covers on your drums and pianos, and anything that's wood in its case, etc., but wherever possible, remove any barriers between wanting to play, and playing. 9) Record the kid's lessons. If she can listen back to what the teacher said and did, it will help her to be consistent, and avoid falling into bad habits. When it comes to memory, the crappiest smartphone is better than the sharpest mind. 10) Make sure they're practicing the hard parts. Playing the stuff you can already play isn't good practice. You want to go over the parts you can't do until you can. Otherwise, you're just messing around. If you catch them slackin', figure out a way to challenge them. 11) Check the teacher's references. Ask the teacher if you can contact other parents and kids that he has worked with. Just because someone is a good musician doesn't mean that they're a good teacher. 12) Pick an instrument that's portable. You can take a guitar or violin to school, on the train, or on vacation pretty easily. You can't take a harp to a beach party... or really anywhere for that matter. Almost no one has a bassoon sitting in their living room, so when you're over for dinner, the chances of them asking you to lead an impromptu version of "Piano Man" or "Sweet Caroline" diminish dramatically. However, if you play piano, your chances of becoming the life of the party go way up. 12a) I learned a lot more from my guitar-playing friends than I did from my music teachers. Having an instrument that you can easily carry around to school and to friends' houses might help your kid learn faster and practice more often, to say nothing of making them more social. 13) Make practice important. I don't remember 99% of what I learned in school, but I still play the instruments I practiced way back then. If you tell your kid that homework has to be done, but practice can be skipped, you're devaluing the music. I'm not saying Algebra is unimportant. But is it objectively more important than music? If you think so, maybe you should watch Ken Robinson's TED talk on creativity. The benefits of the arts go way beyond tinkering with an instrument. It's therapeutic, fun, challenging, rewarding... Algebra is none of those things (unless you're insane). 14) Write up a contract with your child's teacher. When is it okay to cancel lessons? Will they be made up? What holidays will get in the way of lessons? How and when will payments be made? These things don't become a problem until they become a problem, if you know what I mean. Better to clear them up at the start, instead of waiting until things get awkward. 15) Kids need little victories. A kid who learns how to play a very simplified version of a song he likes will get a taste of success, and hunger for more. He'll learn that putting in the work leads to rewards. If the teacher leads off with scales, something a kid probably can't relate to actual music at the get-go, it will be much easier for him to give up. Bonus: 16) Downplay "talent" and focus on the work. Watch Derek Sivers' video on "The Importance of Failure." You'll discover that students who are told they're "naturally gifted" won't work as hard, and won't succeed as much as those who are rewarded for diligence. Bonus: 17) Technology has revolutionized music lessons. Use it to your advantage. "Guitar Hero" rewards practice, builds a connection to real music, and improves dexterity. YouTube allows students access to the best teachers in the world 24/7, at no cost to the student. Berklee College of Music has entire courses online, available to anyone. Every guitar tab in musical history is accessible from a smartphone. The resources are limitless, so now, pretty much every musician could be amazing at their chosen instrument if they're willing to put in the time. The benefits of having feedback from a real teacher will always be critical to success, but there's so much help out there in our interconnected world that every previous generation of musicians would have killed for. Ever thought of having your kid learn sitar from a teacher in India? Bagpipes from someone in Scotland? Thanks for reading, as always. If you could see it in your heart to share any of my articles within your circle of influence, I would greatly appreciate it. I also want to extend special thanks to Joy E., Curtis E., Matt R., and Dan I. for their input on this post.